“Courage.” It means to try hard in struggling with all obstacles and always keep trying. I am 14 year-old and I study in 8th grade in the Kauk Rovieng lower secondary school. I have 3 siblings 2 sisters and 1 brother, and I am the second daughter in the family. My parents are both rice farmers. When I was 5, I saw my brother and sisters went to school and I was very happy and wanted to go to school like them too, but my parents could not afford to buy a uniform, note books, pens and pencils. Because I really wanted to go to school and wanted to study, one day I went to school with my brother and sisters without letting my parent know. I also tried to make a little money by myself, pulling up the water lily, a vegetable for cooking found in ponds, to sell in the village everyday to get a very small amount of money to buy uniforms, school bag, note books, pens and pencils. Then I went to study in the 1st grade in the Tol primary school. Every morning before going to school I had to do cleaning, like clearing the cow’s dung under the house. At school I tried hard to study and listen to the teachers. After school finished at 11:00 AM, I came back home to take the cows to the field to eat grass. Then I rested at home until 1 PM when I took the cows to drink water in the ponds. I took them back home in the evening. Every evening I helped my parents by carrying water from the well to put in the jars. On the school holidays and Sundays I went to help the villagers to harvest their rice to get a little money for buying books. Because I have been trying hard to study, I succeeded in getting from the 1st grade to the 6th grade. I entered the 7th grade in The Kauk Rovieng lower secondary in the school year of 2010-2011 and now I am in grade 8. Facing poverty my mother insists that I quit studying to go to work in the garment factory to earn money to support the family, but I always object to her ideas because I fear that I will lose my opportunity to study. I don’t want to quit school. Most of the time when mother asks me to go anywhere that could affect my studies, I will oppose those ideas. I don’t want to go away to find a job to do instead of working in the village helping farmers to harvest rice and picking cucumbers to get a little money so that I still can go to school. Just the same, I would like to thank my parents for raising me from when I was a baby until I am grown up. They work very hard to make money for me and my brother and sister. And also I would sincerely like to thank all my teachers for their efforts to teach me and explain things to me. Because of that, I have good grades every month. When I grow up I want to become a good teacher. I understand the word the “courage.” It means struggling to solve problems and speaking out what I have in my thoughts. 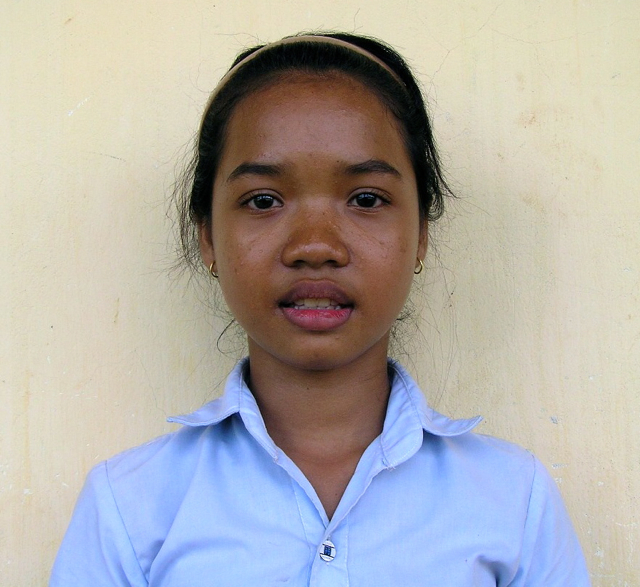 I am 15 and I live in the Kauk Rovieng school village. When I was 6 years old I went to study in the 1st grade in the Kauk Roving primary school until I was in the 3rd grade. At that time my father became seriously sick so my mother decided to stop me from going to school for a while so I could take care of him and my sick 75-year-old grandmother. My brothers and mother had to travel away from our home to find jobs in order to get money to support the family. A few months later, my father agreed to let me go to school again. I was very happy to go back to study again. I woke up very early at 4:00AM to pick the morning glory, water lily, kanchhet (it is a plant that grows on the water like morning glory) to sell in the village. Then I came back home to cook the rice porridge for my parents. After school I went to find palm flowers that have fallen from the palm tree (for use as cooking wood). Besides that villagers hired me to look after their cows. They gave me 300 riels or 75 cents a day. I saved the money for buying rice. My mother sent money home (30000 riels or $7.50 a month) for paying for my father’s medicines to cure his ailment. I sometime skipped school because I went to help villagers to harvest rice and they gave me 3500 riels or $0.88 a day because I was not adult yet. My father’s disease was getting worse day by day and he started to have very pale skin and his stomach became bigger and bigger. I was very shocked to see his condition and so I walked with him to the commune hospital doctor who diagnosed him and told him that he had liver disease. His liver was greatly enlarged. Doctors gave him some medicines to take at home. Later he died. After my father died my mother asked me to stop study for a while again to look after my grandmother and little brother and sister. I went fishing in fields and caught the small fish and snails for cooking. I also looked for cooking wood. I put the wood on my head to sell in the village. Because of poverty my mother asked me to stop studying for one year when I was in the 6th grade. Later on I thought myself that there was nothing better than knowledge, so I went to school to study again with help from my aunt and my uncle. They bought me notebooks, pens, pencils. I was very happy all the time when I thought that I have the chance to go back to school again. When I was in the 7th grade my close classmates gave me some old school uniforms and they always encourage me to continue studying. These made me study harder and harder until I finished 7th grade. Now I am in the 8th grade. I strongly determine that I must continue my study until I finish high school. My dream in the future is that I want to be a good teacher in our society.